TopSecret - automated adviser for professional work in the foreign exchange market. The decision-making algorithm is based on my own method. Statistical methods for a certain time interval is calculated the price level to which the current market price of the trading instrument is always likely to return. The adviser works on any time period, but I recommend working on H1, H4, D1 . 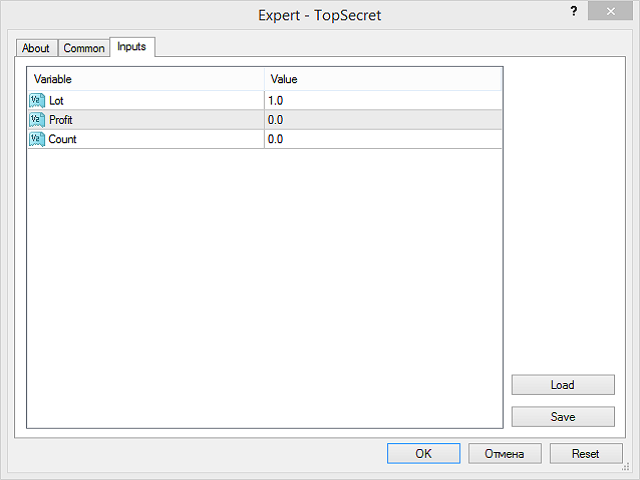 The Expert Advisor is installed in the usual way and is immediately ready for operation. Works with any trading tools. I recommend to beginner traders to leave the default parameters, and choose the volume of the trading position Lot = 0.01 per 1000 units in the deposit currency. More experienced traders can optimize their Profit and Count parameters. Optimize the parameters you need for the last month.